Screen Door Handle - Pretty much any handle will do! If you need to replace your screen door handle, the nice thing about it is that many different types of handle can be substituted. Even kitchen cabinet handles can be used in a pinch. But its best to stick with a proper one if you want your screen door to slide in between glass panels on your patio door. Usually the handle is only necessary on the inside because screens often have a vertical fin on the outside that serves as a pull. Some sliders use handles that have a lock as well. If you cant find the proper pull with the lock it may be better to find a surface mount lock with a handle to replace the existing one. Some manufacturers have come up with interesting ways to mount handles. One of the more popular sliders uses a pull that slides into a groove or track that runs from the top to the bottom of their sliders. The manufacturer makes a notch in the vertical rail, so the pull wont slide all the way to the floor. Then a hasp is installed just above the notch and on the door jamb. The pull slides into the hasp to lock the slider. To open, you slide the pull up and out of the hasp.The pull itself works as a lock, that is until it breaks off. But even these can be replaced with a simple pull from Lowe's or the Home Depot, and if you want the lock, those same stores often have locks that work far better anyway. Some of the better sliders have handles and locks that are virtually the same as those used on your patio door. When these break its also easy to add on a second handle if the original manufacturer cant be found. Dont hesitate to use the contact form and get in touch with me if your local stores are not helpful in locating a handle for your door. Some of these pulls come with latches built in. These latches are intended just to keep the slider closed against the wind, they really are not intended for security purposes such as keeping burglars out. There are basically two types of latches. Surface mount and Mortise. The mortise style usually has a metal latch that slips inside the screen door frame, and a lever the sticks out which you move up and down to lock it. 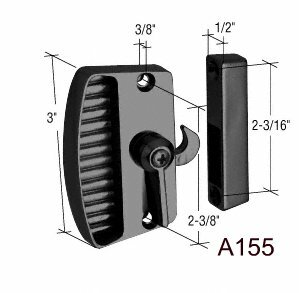 The A145 lock shown below is a mortise style. Its the same lock I use on my knock down slider kits. The big advantage of a mortise style latch is that you can have the slider right up against the sliding glass door and still be able to slide it back and forth and lock it. 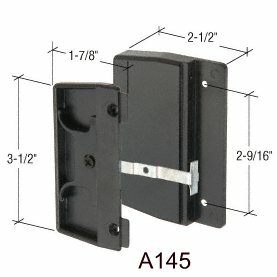 The A155 latch shown below is a surface mount lock. These locks are a little more substantial than the plastic and sheet metal mortise styles. This one is made entirely of diecast aluminum. Because they mount on the inside of the screen door you must have enough space between the screen door and the sliding glass door for them to fit.